A cross-section of the human brain showing the region affected by parkinson’s disease. What do Boxer Muhammad Ali, former President H.W. Bush, Singer Neil Diamond, Actor Michael J. Fox, and the Reverend Billy Graham all have in common? Parkinson’s Disease, a long-term degenerative disorder of the central nervous system that mainly affects our motor functions. The disease is one of the conditions we see often at our Tuscaloosa Assisted Living Community. Here in Tuscaloosa, we love our Alabama football. Elevated instances of Parkinson’s Disease have been observed in football players who suffered concussions, along with memory loss and early-onset Alzheimer’s. “The cardinal symptoms of Parkinson’s disease are resting tremor, slowness of movement (bradykinesia) and rigidity. Many people also experience balance problems (postural instability). These symptoms, which often appear gradually and with increasing severity over time, are usually what first bring patients to a neurologist for help. Typically, symptoms begin on one side of the body and migrate over time to the other side,” reports the website of the Michael J. Fox Foundation for Parkinson’s Research. Also common are sleep difficulties, loss of sense of smell, constipation, speech and swallowing problems, unexplained pains, drooling and low blood pressure when standing. 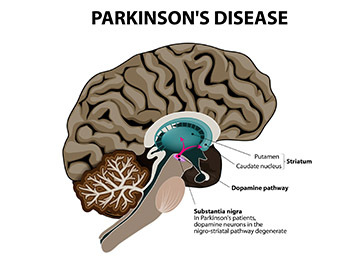 Unfortunately, because there is no definitive test for Parkinson’s disease, and because Parkinson’s disease symptoms are similar to those of other neurological conditions, the misdiagnosis rate remains significant. It is worthwhile to consider a second opinion and to reach out to a neurologist with specific expertise in movement disorders. Exercise, engaging in classes or artwork, stress reduction are all ways to cope with a diagnosis. “Many neurologists report that symptom deterioration is often significantly slower in those who take a positive and proactive stance toward their condition than in those who do not,” the website says. Assisted Living Communities like ours in Tuscaloosa can provide a great environment for those with Parkinson’s because of our focus on compassionate care and outreach to those with motor control and mobility issues. Our facilities contain railing and other tools to assist those who struggle with maintaining balance. Loss of balance can cause falls that result in serious injuries or death. The seriousness of such incidents depends greatly on the patient’s age, overall health, and disease stage. Additionally, assisted living facilities usually employ skilled medical professionals standing ready to assist with medication reminders and providing basic care. If you or a loved one suffer from Parkinson’s, a move to assisted living could make a big difference in maintaining independence while not having to rely on family to offer caregiving. This results in greater peace of mind for everyone involved.